The Louisville Waterfront Fourth celebration will take place on Wednesday, July 4th, 2018, and will feature free musical entertainment, expanded family activities, a patriotic installation of 15,000 US flags, festival cuisine, and a Zambelli fireworks display from a barge on the Ohio River. The 2018 festival will feature upbeat music in the genres of Funk, Soul, Jazz and Hip-Hop. In between all bands, guests can dance to an eclectic array of sounds from The Spinsters Union of Louisville. They are a collective of Louisville’s best female and gender non-conforming DJs and producers. Spinning ambient, disco, electronic, funk, garage, hip hop, house, jazz, metal, R&B, rock, soul, surf, techno, twerk and more, Spinsters bring fire to every engagement, lighting up dance floors & chill out lounges all while promoting collaboration, inclusion and empowerment throughout their scenes and communities. 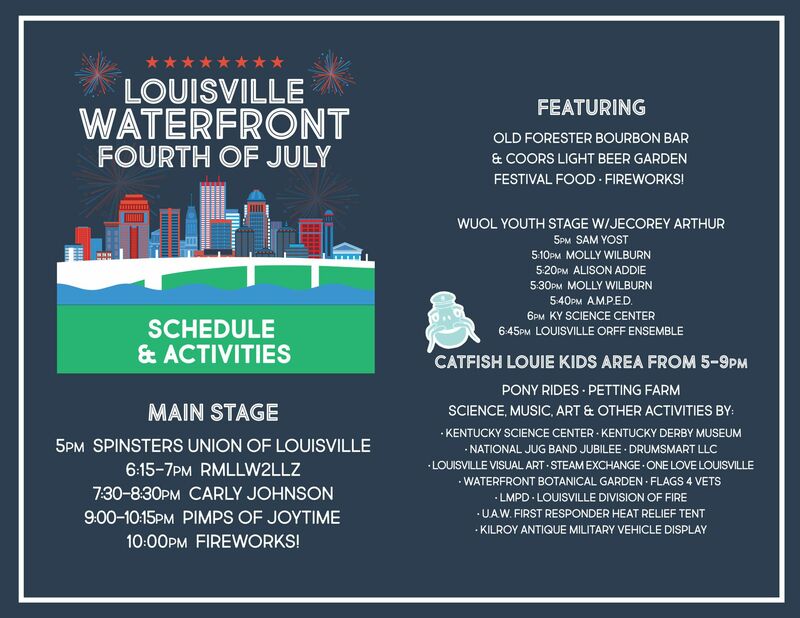 The family-friendly Louisville Waterfront Fourth celebration will open at 5pm with a variety of activities produced by popular arts and cultural attractions in the Catfish Louie Kids Area. The activities will be nestled in the shade of the trees near the Children’s Playground and will appeal to a variety of interests – Science, Music, Art and Nature! There will also be a large area devoted to engaging with our community helpers. Families can meet our first responders, fire fighters and police officers who will have special equipment on display. The Kentucky Science Center will provide science activities and demonstrations. New to the event for 2018 is the WUOL Youth Stage, hosted by Jecorey Arthur. The National Jug Band Jubilee will provide music education activities by helping children create their own musical instruments, which they can use to join in a jug band performance! DrumSmart LLC will engage community members of all ages and abilities in a drum circle that will make you feel refreshed, creative, and full of energy. 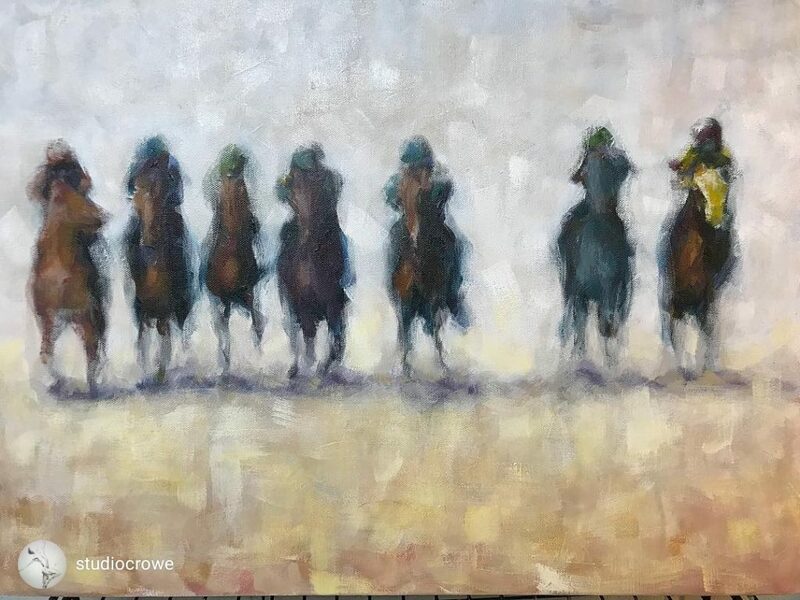 There will be art activities for children by Louisville Visual Art and Steam Exchange; nature activities by the Waterfront Botanical Garden; and lawn games, pony rides and a petting farm! Other new attractions for 2018 include the Kentucky Derby Museum, One Love Louisville, and the Mayor’s Office for Safe & Healthy Neighborhoods. 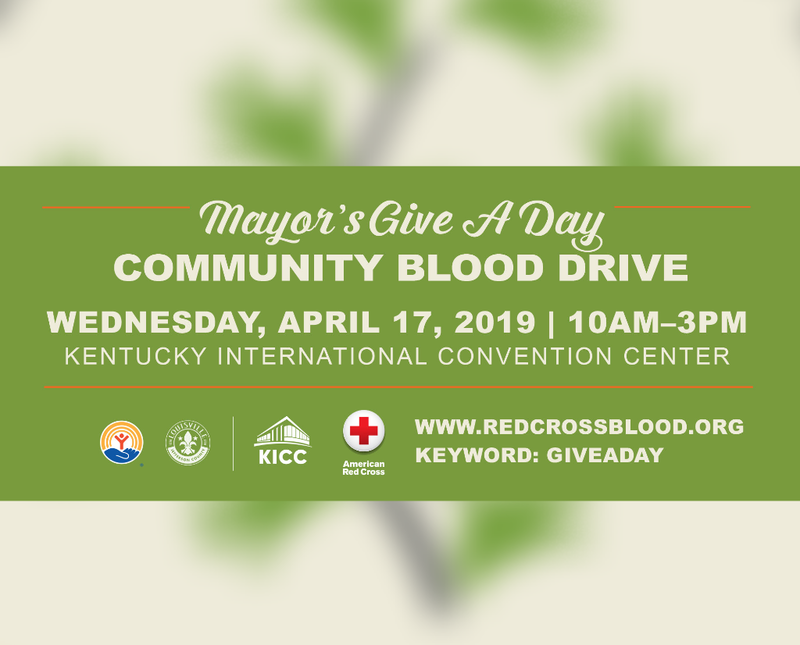 Louisville Metro Police Department and Louisville Fire Department will have a helicopter and other safety equipment on display for children and families. These activities will occur from 5-9pm and are completely free. Flags 4 Vets, the Louisville based National Flags For Veterans Graves program, will create a special July 4th patriotic flag installation beginning at noon on Wednesday, July 4th. The public is invited to help place 15,000 US flags, one by one, in a 50’ x 300’ pattern. Volunteers are invited to help for a couple of hours or a few minutes to place a flag or two in tribute to members of their family who now serve or have served in the United States Armed Forces or as other first responders. After July 4th, the 15,000 flags will be collected and distributed across the USA to be placed on veterans’ graves. The Kilroy Chapter of the Military Vehicle Preservation Association will have several antique military vehicles on display adjacent to the flags. 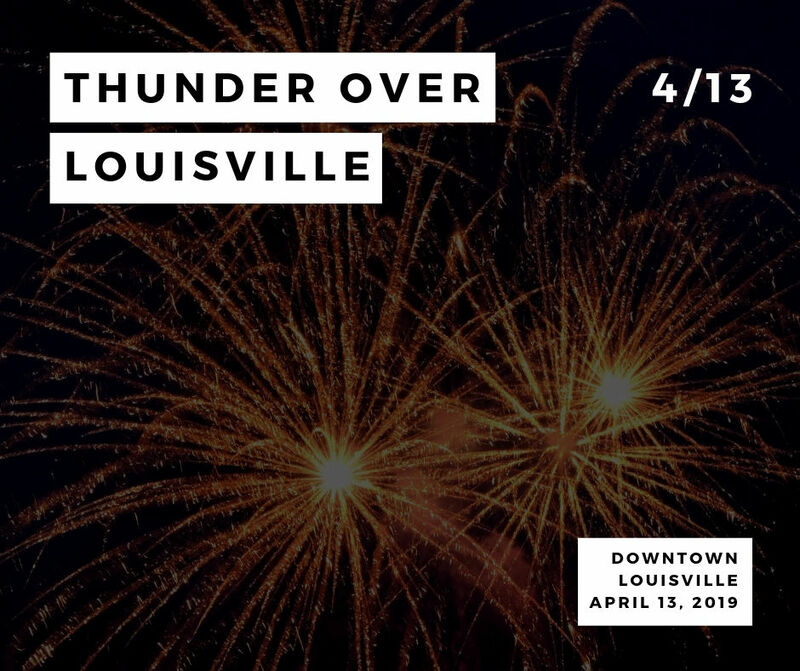 Visitors to Louisville Waterfront Fourth will also enjoy upscale festival fare and festival favorites by Festival Cuisine, including the Coors Light Beer Garden and the Old Forester Bar. The festival menu will include offerings to appeal to the discriminating foodie, as well as traditional festival favorites like corn dogs and funnel cakes. The Zambelli Fireworks Show will begin at approximately 10pm. In addition to the event on land, the public is invited to take a fireworks cruise on the Belle of Louisville and the Mary M. Miller. 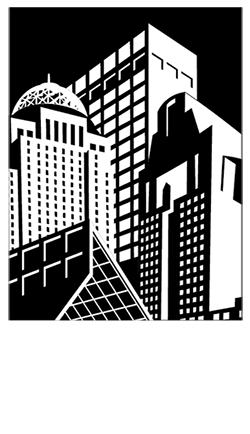 Ticket information is available at www.belleoflouisville.org or by calling 502.574.2992. 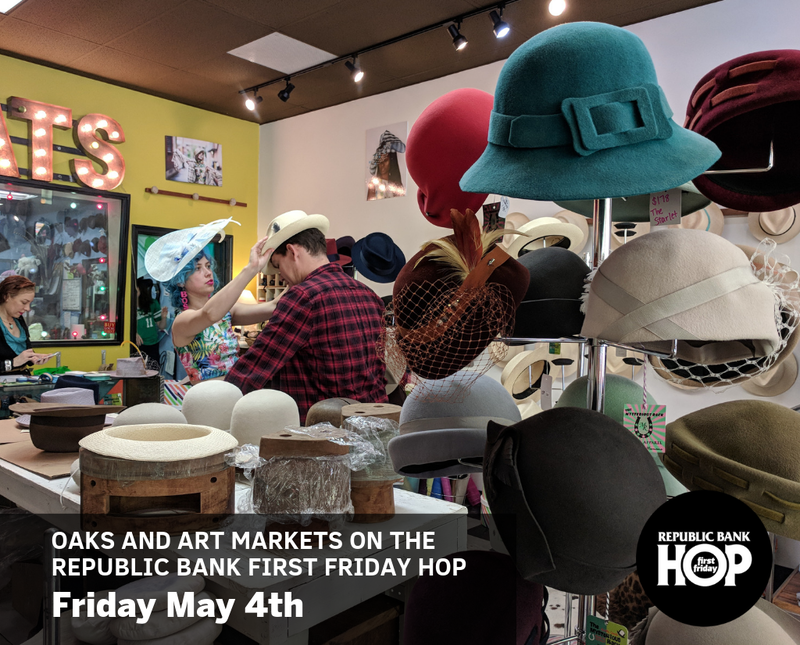 For those visiting Louisville on the weekend leading in to July Fourth, the Fleur de Flea Vintage Urban Market will take place on Waterfront Park’s Festival Plaza on Saturday, June 30th. Glass, coolers, fireworks, pets, outside food & alcohol, amplification devices, signage larger than 24” x 24”, bicycling inside the event, and skateboarding inside the event are prohibited. There will be bicycle racks to lock up bicycles on site. Unopened bottles of water are permitted. Patrons are encouraged to recycle!